This past weekend, I went to go see E in her new environment. It was so fun to see her new apartment and check out the new area she now calls home. But the best thing we did this weekend was eat… and boy, did we eat. Our marathon chow-fest started with our pilgrimage to the Big E, the New England State Fair. Home of the deep-fried, heart-blocking, amazing delicious morsels that E and I treat ourselves to once every year. 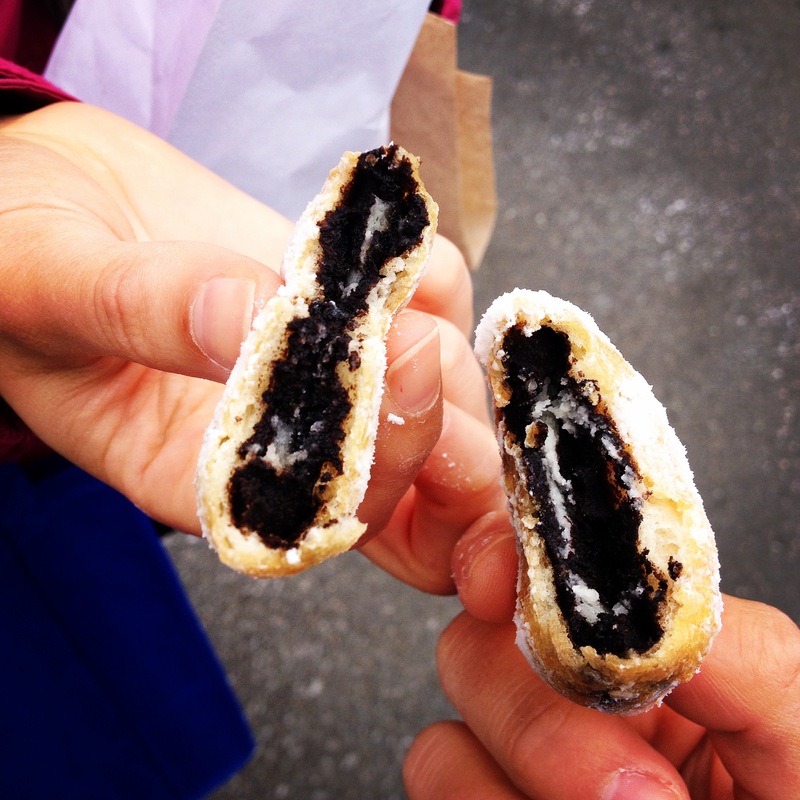 Oh deep-fried chocolate sandwich cookies… you complete me. We also split some beignets, the quintessential New Orleans fried pastry. We were too busy eating them for me to snap a photo. Sorry. The RD2Be in me started to beg for something that was not deep-fried and smothered in powdered sugar, so I started to look for something that was remotely fruit- or vegetable-based. Like these amazing fresh raspberries from the Massachusetts State House exhibit… so pretty and so yummy! But besides eating our weight in fried food, we did actually explore the fair. Like petting a cow at the petting zoo. We became good buds. I now want a cow. Or listening in on a school lesson from the early 18th century. But ultimately, when E and I are together, it always comes back to food. Like these donuts from a local hotspot near her house for Sunday breakfast. It was a perfect weekend for me and my sister – we not only ate delicious things but we also were able to sit, reconnect, and share in our love of all things food. It was truly one of the best sister outings we ever had. Did you do anything fun this weekend? Let me know!